Bonjour ladies... I am ecstatic that my friend AJ is filling in for me today. I think AJ and I have my favorite blogger friend connection - we met on Instagram y'all, and you know how much I love those tiny little pictures! She is also an Arkansas girl, shoe connoisseur and lover of pugs (even has her own little pug cutie!)... long lost "sole" mate I tell ya! For outfit #1, I chose an Old Navy printed sweater (they have some cute ones this season! ), and contrasting colors in this Limited Necklace and Sole Society flats. Finish it off with a slouchy bag and you're ready to hit whatever the weekend brings. Outfit 1: Sweater, Old Navy. Jeans (Signature Skinnies), bag (Caper), JustFab. Necklace, The Limited. Shoes, Sole Society. For outfit #2, I wanted to a dressier outfit, well suited for a girls night out or date night. 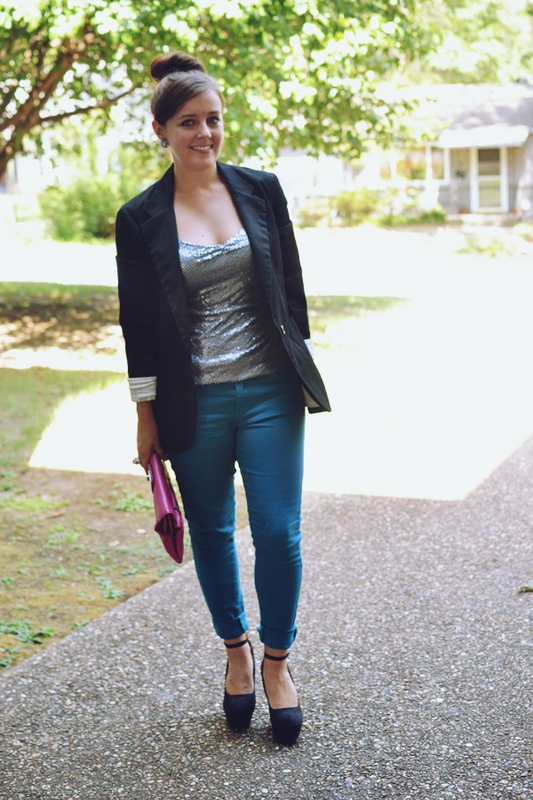 My formula for dressing jeans up is pretty straight forward - blazer, sparkles, and tall shoes. Top it off with a knot and hit the town. Outfit 2: Top, Limited. Blazer, Target. Heels (Sarada), JustFab. Clutch, XXI. Ring (Rose Palace Dome Ring), JewelMint. For outfit 3, I couldn't help myself, I went full fall and paired the jeans with one of my favorite sweater vest/wrap/thingies and threw on a scarf and boots. It'll be a few months still until I can even think about wearing this, but I wanted you guys to see how cute colored skinnies will be for the rest of the year with boots! Outfit 3: Top, Forever 21. Scarf, sweater, Limited. Boots (Nabila), Clutch (Hot Spot), JustFab. Ring, Lia Sophia. So there you have it! Three ways to rock colored jeans post summer. If you're anything like me, you bought every color this spring and summer so I know you'll be looking to remix them all year round! Big thanks to Jessica for hosting me today! You can find me on Twitter, Facebook, and Pose if you have any questions about colored denim, and drop by anytime at AJWearsClothes.com! Oh man - one day I am trying to extend Summer, the next I am dreaming of Fall... this "transitional" weather is messing with my emotions... but I think AJ has just pulled me over to the Fall side... love me some color jeans & boots and can't wait to try out some of this delicious inspiration! i love EVERY SINGLE look! you look amazing! and i have yellow bow flats JUST like those! now i gotta try a look like this! 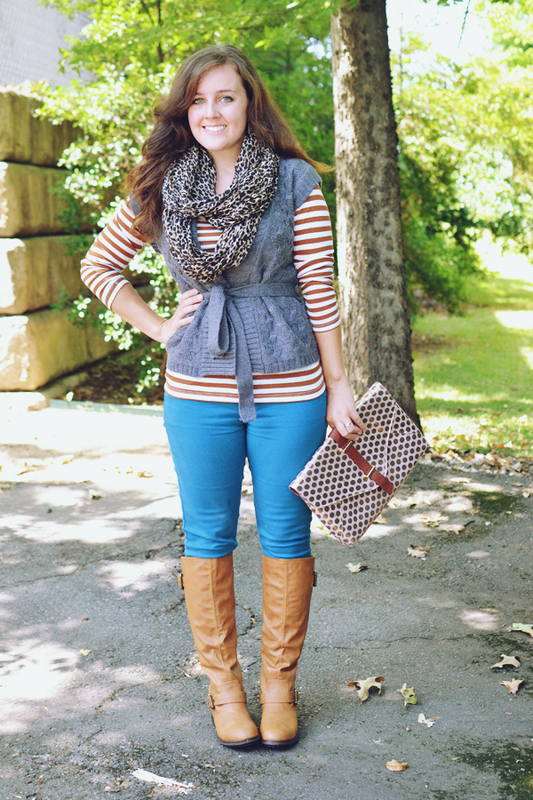 Love the way you styled these jeans! My favorite is the second one! The sparkly top, and those heels are fabulous! gorgeous outfits!! i adore how you use colors!! These are all so cute! I never thought to wear my colored denim for a dressy look so you've certainly inspired me! 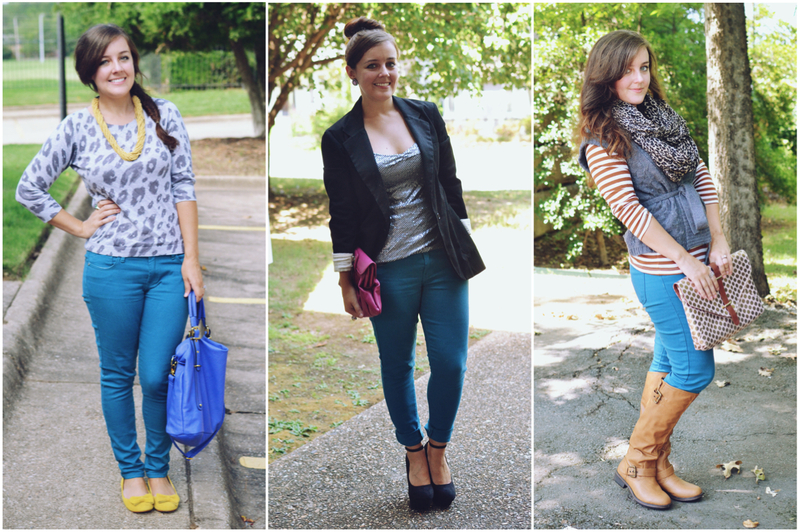 I am very much in favor of colored denim for fall! I may or may not have already worn colored denim twice in the past 5 days. OK I did. I do love the last look. I love her outfits!! especially the last one! wow. shes is so stylish! i'm so checking her blog! Love them! I’m trying to hold onto some of my Summer items by styling them for Fall - great inspiration! 1. Jessica and AJ are friends?! You both are two of my very favorite bloggers! Mind = blown. One day we should have a big ole southern blogger party, ya'll. 2. 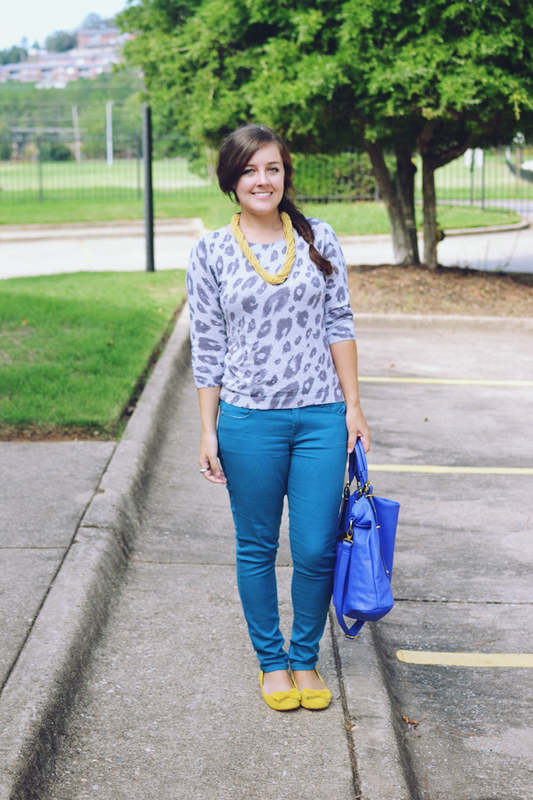 I was JUST pondering if I could transition my bright blue skinnies to fall/winter and you read my mind! Such great ideas! Thank you for the inspiration! She has some serious fashion skills! Thanks for introducing me! Following her now. She is precious! I love colored denim, and I just bought a pair of similar turquoise jeans. Now I have some awesome ideas for styling them, thank you!